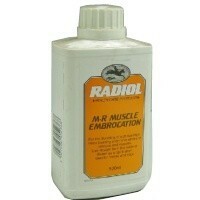 Radiol MR Muscle Embrocation for Dogs & Horses is a specially formulated solution for the soothing of all minor swellings, minor bruising and minor strains to tendons and muscles. This soothing embrocation can be used directly from the bottle or diluted as directed, for an easy to use hassle free process. Ideal for all dogs and horses that are suffering from these minor swellings, bruising or strains!